Sweet but not overly sweet with just enough bubbles. Great as an aperitif or with light meals. Refreshing taste with a clean finish. 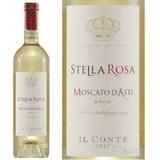 Moscato D’Asti is a “semi sweet” wine made from the Moscato di Canelli grape from the Piedmont region of Italy.